WASHINGTON -- John McCain will make a dramatic return to the Senate for a make-or-break vote on GOP health care legislation Tuesday, just days after getting diagnosed with a brain tumor. The decision by the 80-year-old senator to travel to Washington from his Arizona home was announced by his office in a brief press release late Monday night. It comes with the GOP health care bill to repeal and replace "Obamacare" on the brink as Majority Leader Mitch McConnell pushes toward a pivotal vote Tuesday prodded by an impatient and frustrated President Donald Trump. 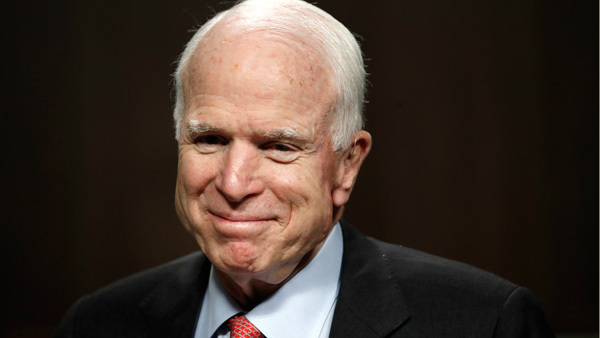 "Senator McCain looks forward to returning to the United States Senate tomorrow to continue working on important legislation, including health care reform, the National Defense Authorization Act, and new sanctions on Russia, Iran and North Korea," his office said. It was the latest head-spinning turn of events for health legislation that's survived several near-death experiences in recent weeks, yet could make it past a critical hurdle Tuesday with Republicans determined to make good on seven years of promises to get rid of former President Barack Obama's law. McCain's startling decision to return suggests McConnell believes Tuesday's vote will be successful - with McCain's vote. McConnell, R-Ky., said he's "made a commitment to the people I represent" to undo Obama's health care overhaul, in what seemed a pointed reminder to Republican senators that they've made the same vow. At the White House, Trump lambasted Democrats who helped enact the 2010 health care law and uniformly oppose the GOP attempt to scrap and rewrite it. "They run out and say, 'Death, death, death,'" Trump said, with a backdrop of families that he said have encountered problems getting affordable, reliable medical coverage because of Obama's statute. "Well, Obamacare is death. That's the one that's death." Some Democrats have said the GOP repeal effort would lead to death for patients who lose coverage. The nonpartisan Congressional Budget Office has said various versions of the legislation would mean more than 20 million Americans would become uninsured by 2026. But Trump focused many of his remarks on GOP senators. McConnell is nursing a slim 52-48 majority, making McCain's return crucial. "For Senate Republicans, this is their chance to keep their promise. Over and over again, they said, 'Repeal and replace, repeal and replace.' But they can now keep their promise," Trump said. At least a dozen Republican senators have publicly opposed or criticized the legislation, more than enough to kill it. That's forced McConnell to step back twice from anticipated votes and to revise his bill in hopes of mollifying unhappy moderates and conservatives. Moderate Sen. Susan Collins, R-Maine, remained opposed to beginning debate on any option McConnell has revealed so far, and other Republicans remained uncommitted. But senators and aides said talks were underway on issues including potentially giving states more leeway on using federal funds to help people losing Medicaid coverage. "I think we're going to proceed to debate," Cornyn said, though he acknowledged about McCain, "It would help if he's here." McConnell's measure would uproot much of Obama's law, eliminating its tax penalties on people not buying policies, cutting the Medicaid health care program for the poor and providing less generous health care subsidies for consumers.